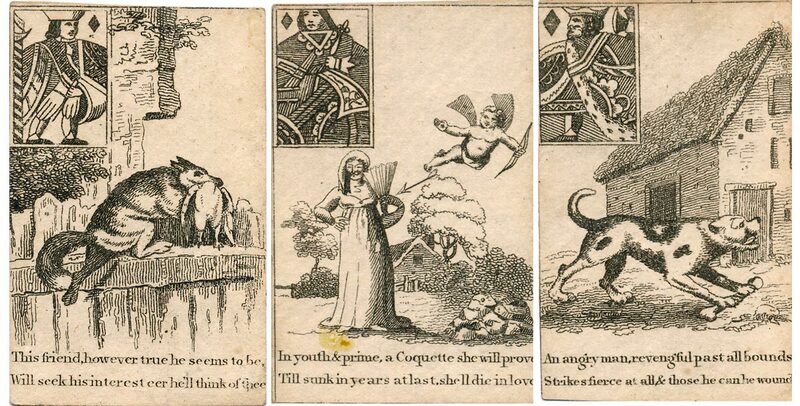 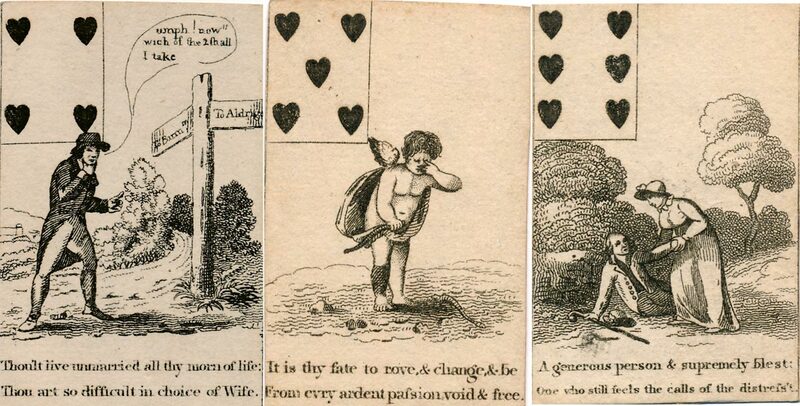 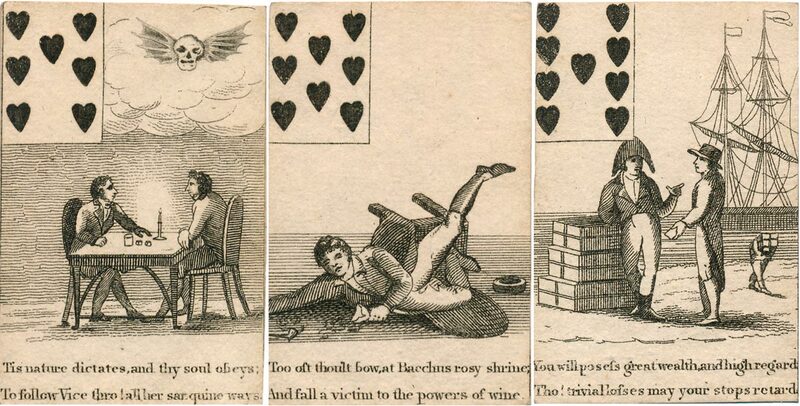 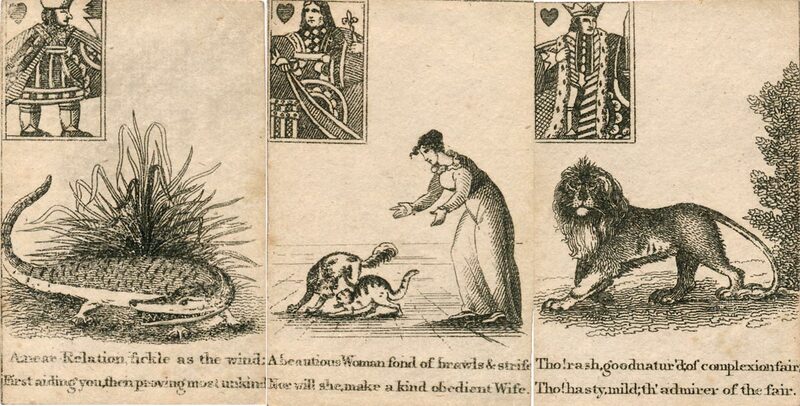 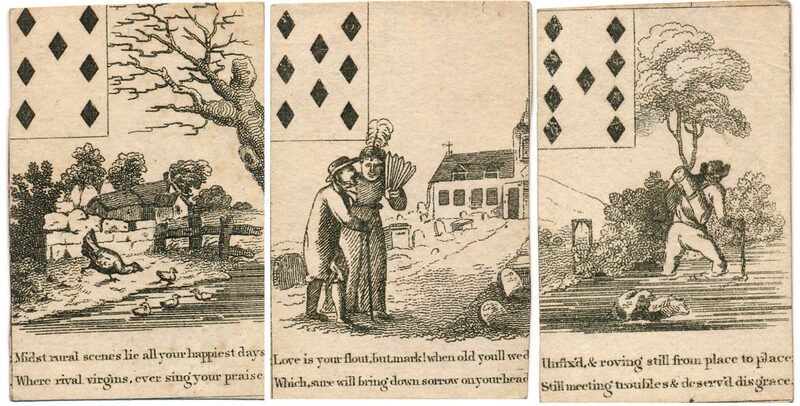 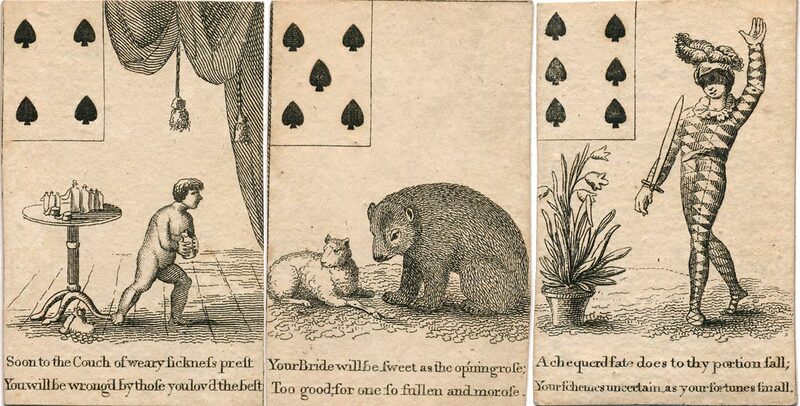 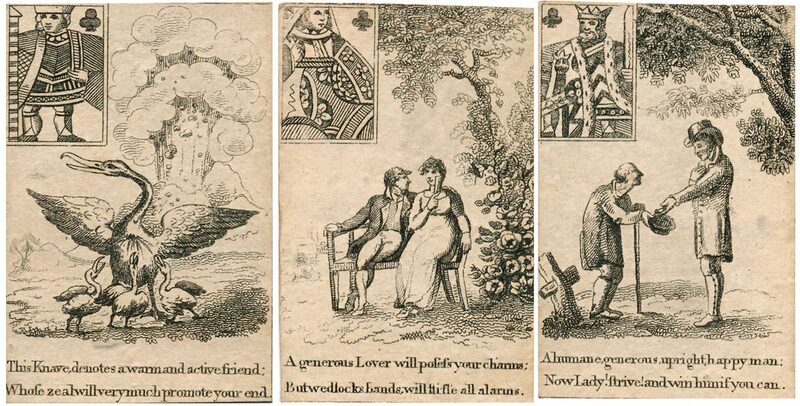 English Fortune Telling pack of c.1800 by an unknown artist / engraver with a distinctive repertoire of imagery resembling the sets of proverbial or motto cards which had been very popular. 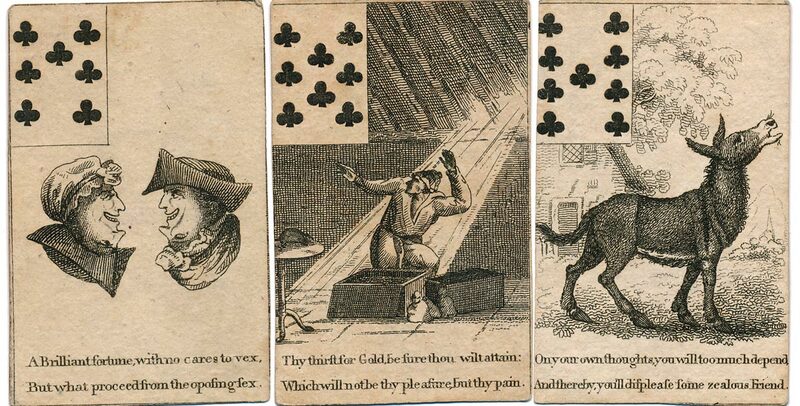 Each card is printed in black throughout, uncoloured, although partly coloured versions are known. 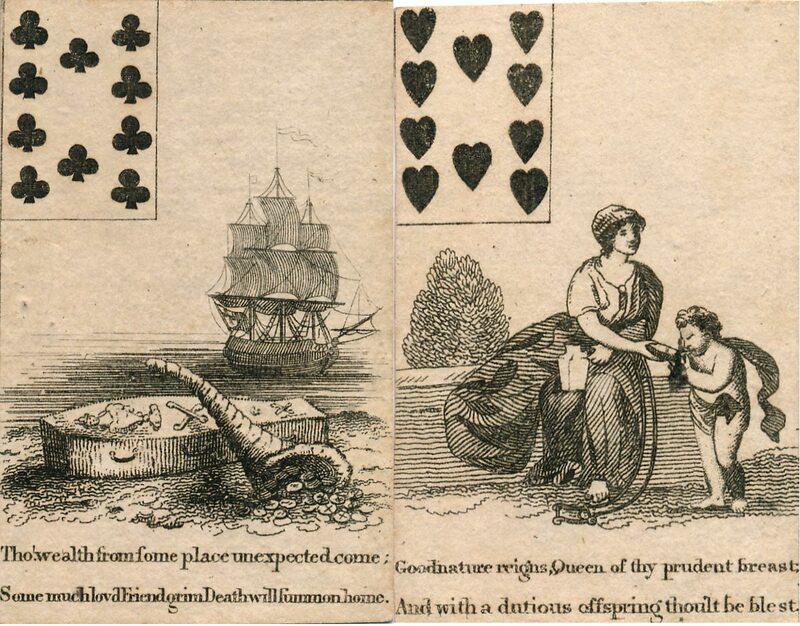 The value is indicated by a miniature playing card in the upper left-hand corner. 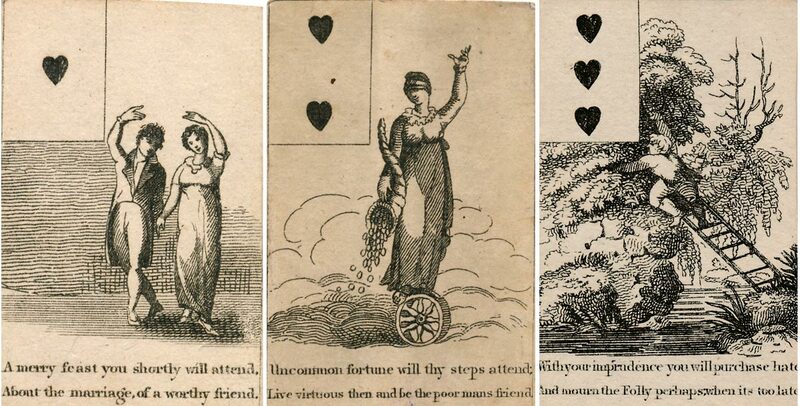 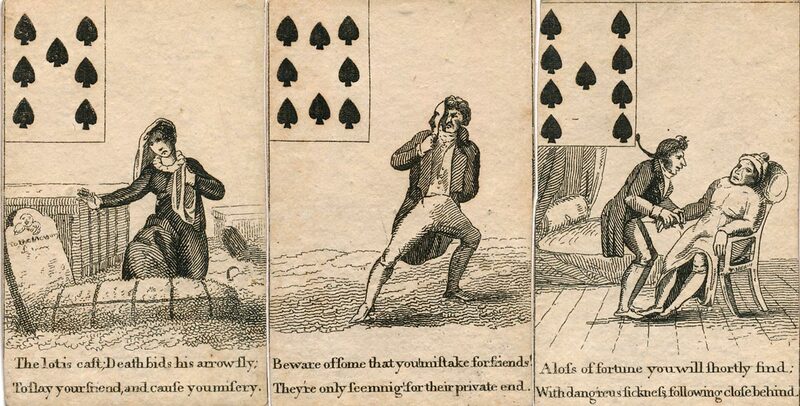 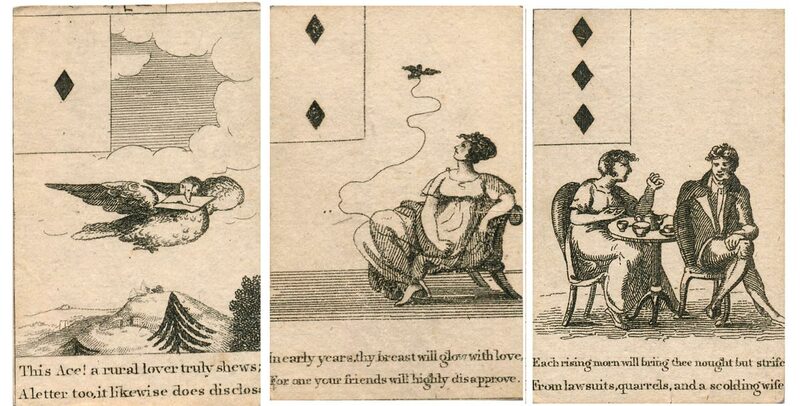 A two-line rhyming fortune-telling prophecy is printed along the bottom of each card, which appear to derive from the text of “Every Lady’s Own Fortune-Teller” 1793► (See p.54 onwards). 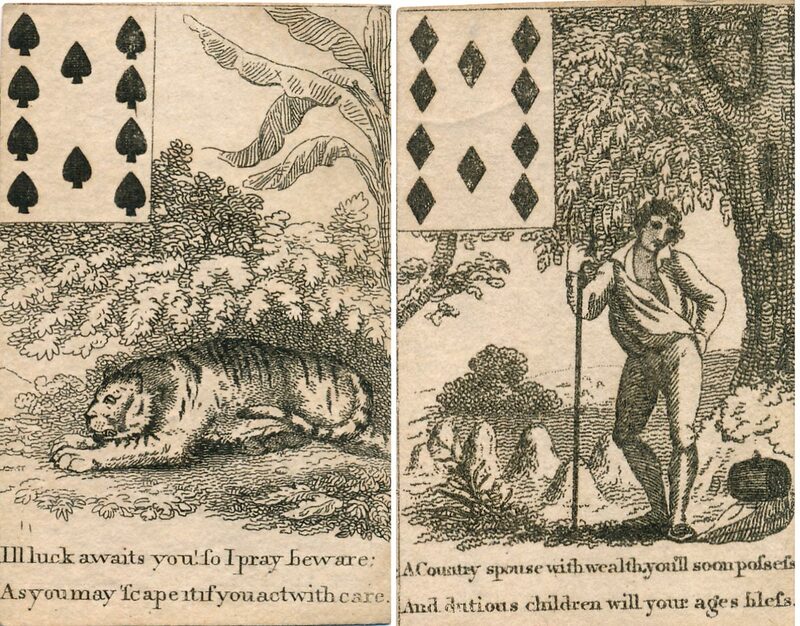 Regarding the miniature court cards, the courts used in these non-standard printed cards are not by any normal card-maker. 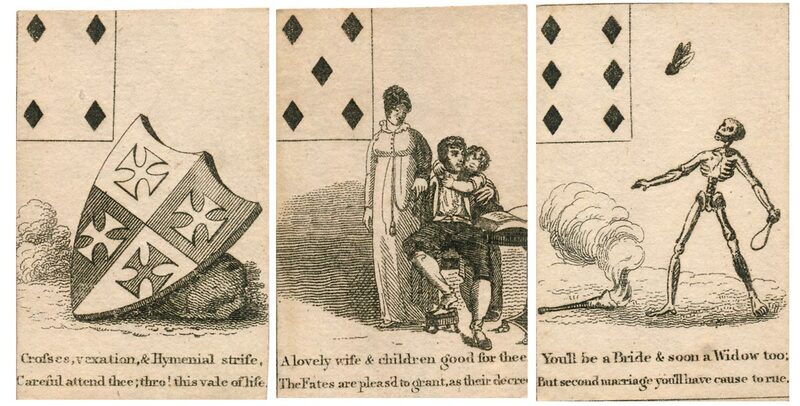 The assumption is that those who made these cards were not classed as card-makers and were not members of the Worshipful Company. 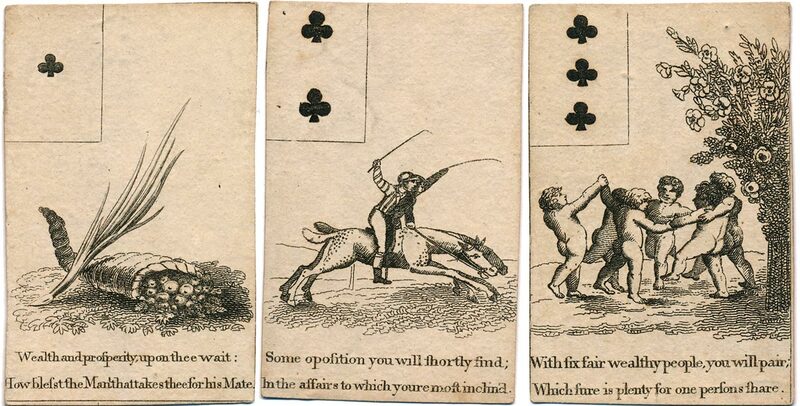 This is further underlined by the fact that in this case the traditional figures mostly don’t appear in the right suits and they would not have been mixed up by a proper card-maker. 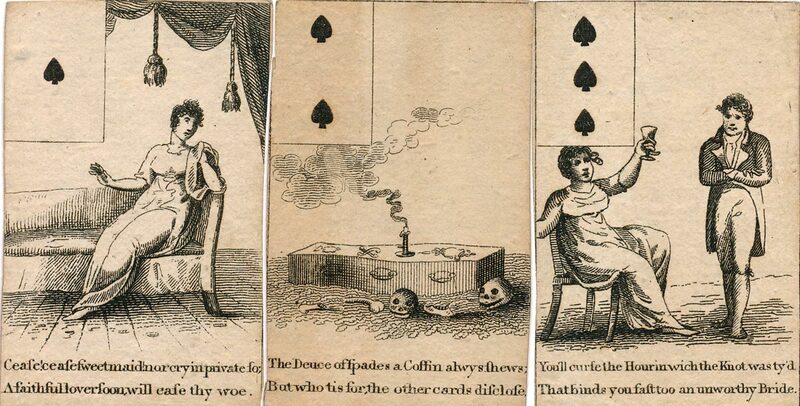 Above: Georgian Fortune Telling Cards, c.1800. 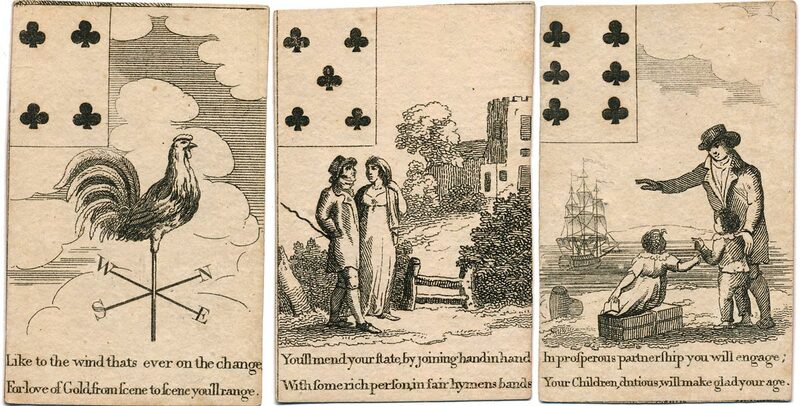 52 cards, plain backs. 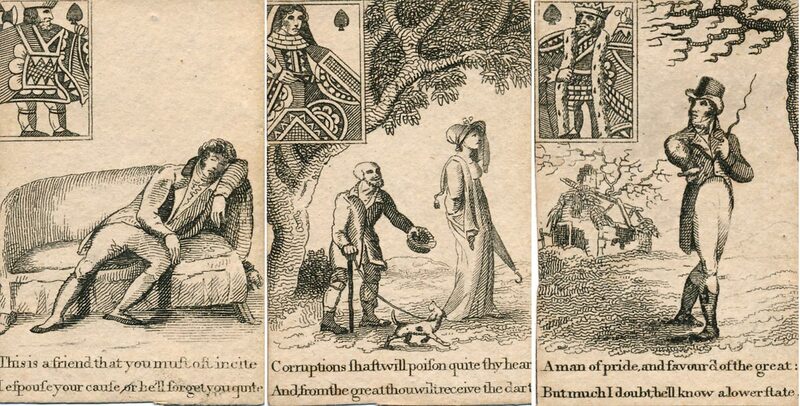 Additional Research by Ken Lodge and Emma Donovan.